This element is one of the transition elements that doesn't place the additional electrons in the outer shell, but in the one underneath. For the fourth period/row, all of these electrons build the third shell to a maximum of 18 electrons. Remember that the first eight were placed during our trip through the third period/row. 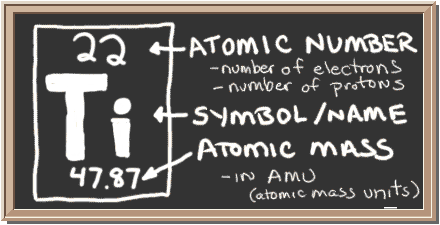 The fourth row of the periodic table has transition metals ranging from scandium (21) to zinc (30). Titanium is a metal. It's not just any metal, it's a transition metal. Being a transition metal, it has a special electron configuration. It adds its next electron to the third shell, not the outermost fourth shell. With a configuration of 2-8-10-2, titanium is out in the world and ready to bond with other elements. It makes many natural compounds with halogens and oxygen. Since titanium is out there with four extra electrons, it is quite flexible and forms many compounds. ► More about the history and places to find titanium.